We will be exploring the teachings on meditation given by the Buddha in the Mahārāhulovāda Sutta (the scripture where the Buddha gives advice to his son, Rahula) and putting this teaching into practice with guided meditation in this three-hour workshop. Join us as we explore body-based awareness with the four elements meditation, and meditation on loving-kindness. In this sutta, the Buddha gives pragmatic guidance that leads us from ordinary, analytical thinking into the heart of awareness. This practice teaches us to let go of concerns and to get out of our own way, so that our meditation can unfold naturally, bringing us to wellbeing, wholeness and liberation. Read the whole sutta here. 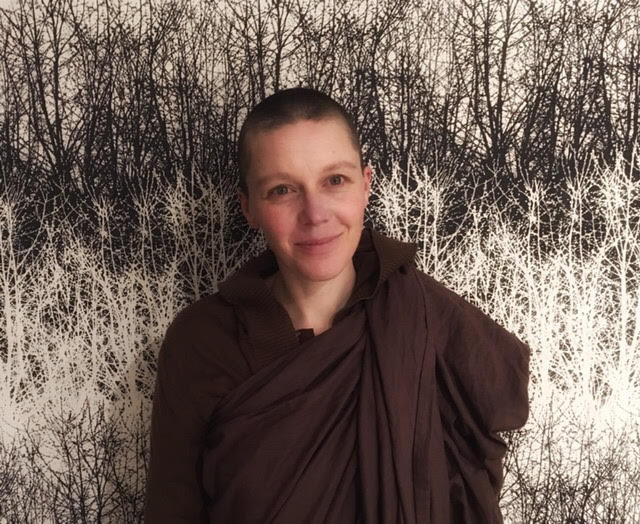 Ayya Aranya Devi began practicing meditation in 1995. She was ordained in the Burmese Pa auk tradition in 2010, and she spent 2 & 1/2 years on retreat in Tusita monastery, a Pa auk branch from Malaysia. She has also studied with Bhante Sujato, does some odd jobs for suttacentral.net and has been an itinerant nun for the last 3 years. She likes finding ways to teach people how to find their true heart in meditation, since this leads to joy and to peace.